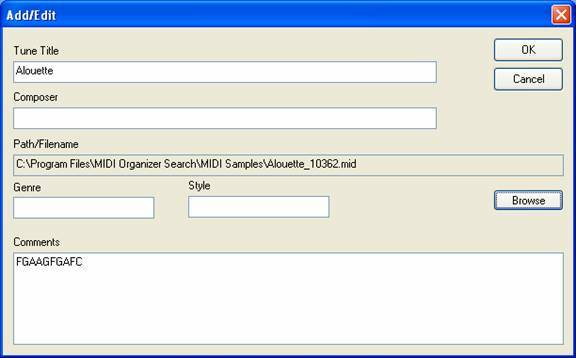 MIDI Organizer and Search has been tested on Windows XP. 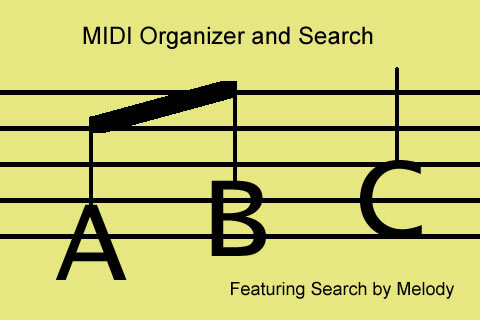 MIDI Organizer and Search is a MIDI program that takes a user defined melody and searches instances of that note sequence for matches in MIDI files located in the midi.mdb Database or selected directories on a hard drive. If the ‘Try in every key signature’ checkbox is checked then the user melody will be transposed into every key and compared to each file’s melody. If the ‘Ignore harmony notes’ checkbox is checked then harmony notes are ignored. NOTE: No MIDI data is ever deleted or changed by this program. All files are opened in Read Only mode. If Windows Installer doesn’t start the install process by itself, double click on Setup.exe. Follow the Setup Wizard instructions. 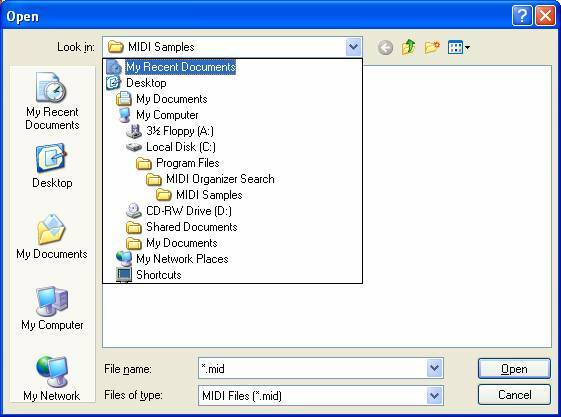 Installation creates 4 folders in the Program Files/MIDI Organizer Search directory. 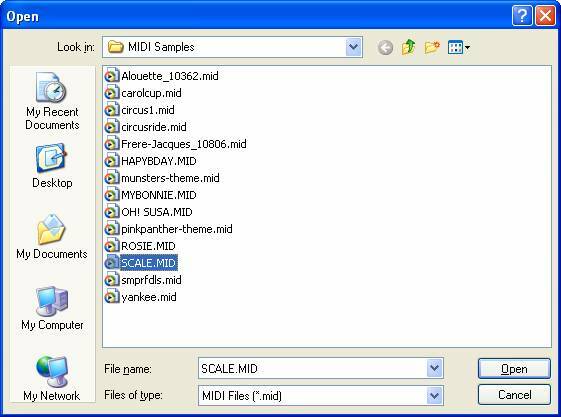 MIDI Samples – MIDI files preloaded into the database and used as examples in the documentation for demonstrating the program. will be removed from the ODBC.INI file. If you then double click on the instadminODBC.vbs file the two lines are added again. 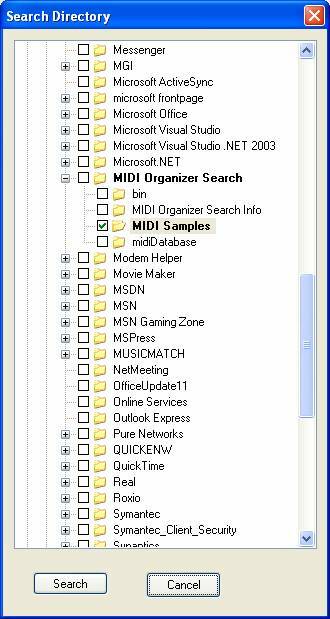 Leave the two lines in if you want to see the midi DSN in your ODBC Administrator Window. 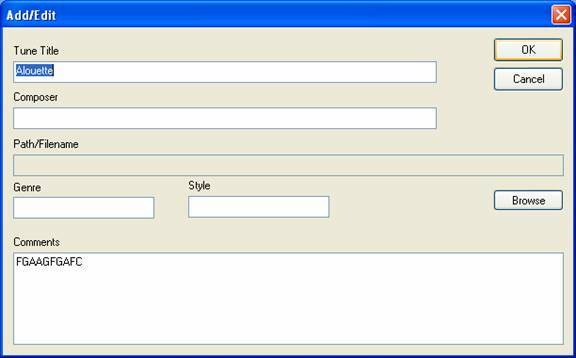 If you resize the columns or the window, clicking the Menu item View - Resize Columns will evenly space the columns across the window. If you left click on a column header, the list is sorted by that column A to Z ignoring upper case letters. 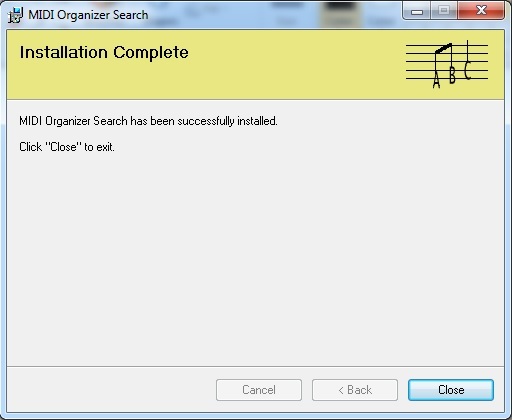 This applies to the main Dialog Box called MIDI and the Search Melody Results Database Dialog Box. 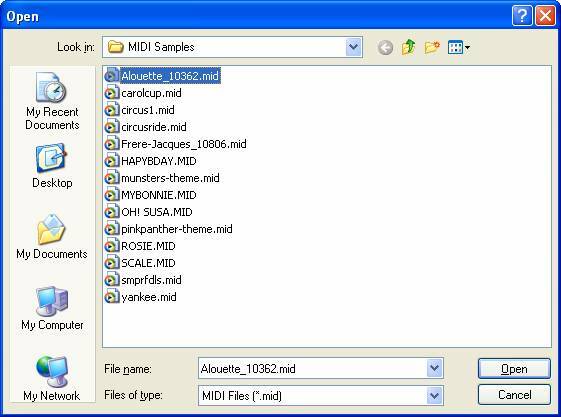 Now you have entered the path to your Alouette MIDI file into the database. Only the file name is shown in the list however. Type C Major Scale in the Tune Title Edit Box and CDEFGABC in the Comments Edit Box. You may put in any or all notes starting from anywhere in the sequence in any key including all enharmonic note spellings up to 2 characters(no double flats or sharps). 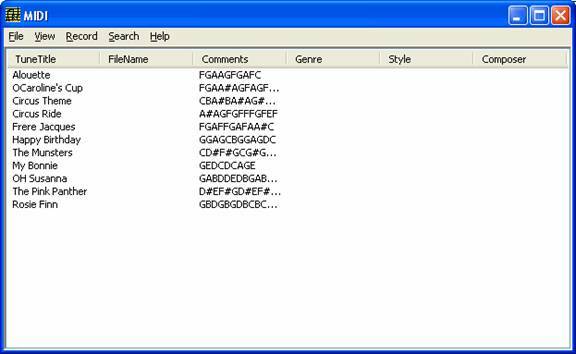 NOTE: The only way to hear the found	MIDI files is to manually play them with Media Player or whatever installed application plays .MID files. I’ve included a “File Path” button on the Melody Search Results Dialog Box which displays the full path to help locate files. Click the menu item Search. 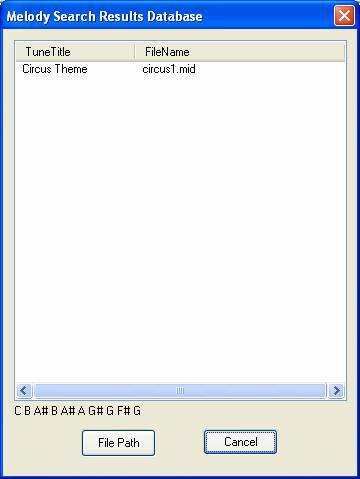 Click the submenu item MelodyDatabase. The notes you entered for this search are displayed above the File Path Button. 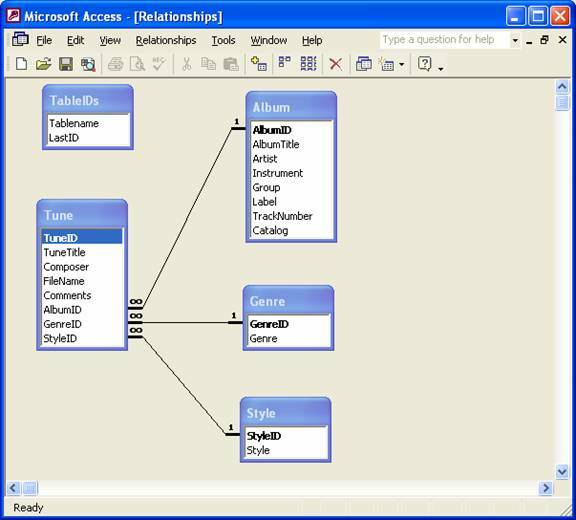 If everything is working, add your own MIDI file Paths to the Database. The Album Table is not implemented yet. 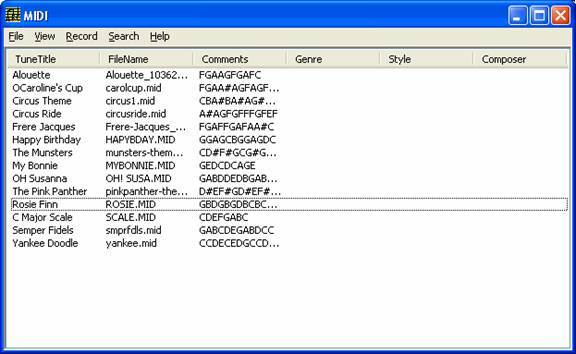 To search your hard drive use the menu item Search, submenu item MelodyDirectory. Using the keyboard this time and the same Melody Search Dialog Box as when searching the database, I have entered the C Major Scale. Navigate to the Samples Folder and put in the check mark. NOTE: Searching the entire Drive: If you put a checkmark on a Drive CheckBox ( C:\ for example) the search will take a long time depending on the number of files. Since the Cancel Button on the StatusBar control of the Search Directory Dialog Box cancels the search process between each directory call, this is seen as one call. This means the cancel button must wait until the entire Drive is searched. In plain English: You will be waiting with no escape button. Recommended: Break down the search into groups of directories. NOTE: If you click on a + box to expand a directory there could be a short wait depending on the number of folders and files under that directory. 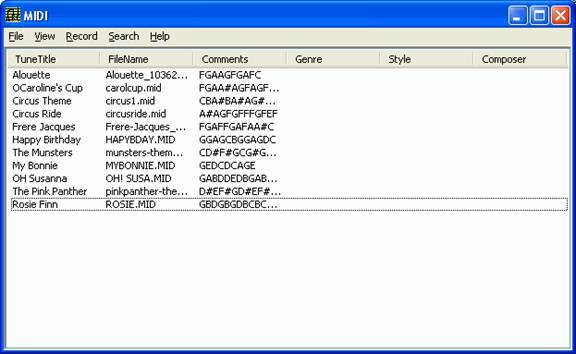 The Melody Search Results Directory Dialog Box gives the found MIDI files. 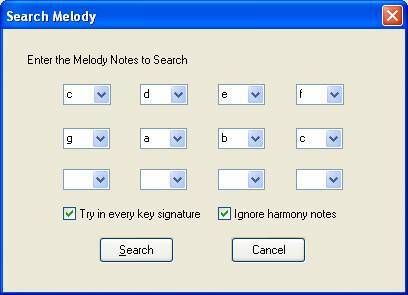 The Melody Notes you typed in for this search appear at the lower left hand corner of the Dialog Box. Unless Windows says otherwise, install the new version of the program on top of the old version. If you want a new database, the old database can be deleted manually using Windows Explorer before doing the new install. First delete the database file then delete the folder. If you leave the database, the new install will leave the data intact. Uninstalling the program using Control Panel Add/Remove Programs removes everything except the midi.mdb database file. NOTE: Don’t use the MIDI Samples Folder to store your own MIDI files. Keep your work in My Documents. Without the CTA program (changed to ITP) at Columbia University I could not have realized this project. I would like to thank all my teachers: Jim Keogh, Ted Fike, Jeff Thaw, Richard Weiss, Lenny Henriquez, and Mario Giannini. When I was really stuck, I would call my tutor John Montoya. 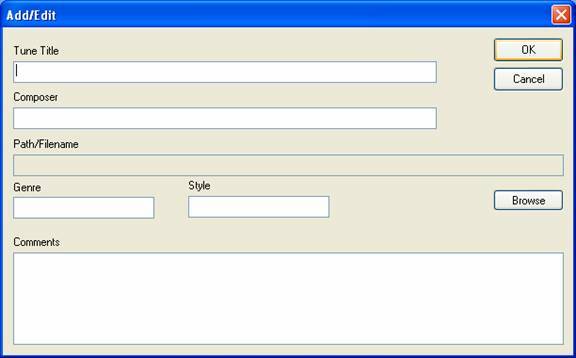 11/22/2004 - Fixed a bug in the Cancel Button on the Search Directory Dialog Box and Status Bar. They now default to the Search Melody Dialog Box. Added a 'Long Processing Time' Warning Message Box if a Drive is selected in the Search Directory Dialog Box. Added Update: mm/dd/yyyy to the Help-AboutMidi... menu item Dialog Box. Documentation. 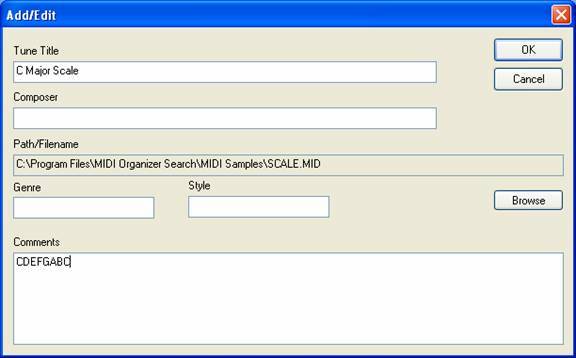 12/10/2004 - Added Click on Column Header Sort Ascending for MIDI and Search Melody Results Database Dialog Boxes. 12/27/2004 Version 1.20 When searching the database, if no path was present in a record, the search stopped instead of trying the next record.